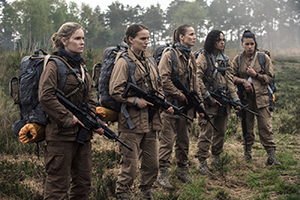 Annihilation is a movie that’s fascinating for all the wrong reasons. It’s an adaptation of the first novel in Jeff VanderMeer’s Southern Reach trilogy and Alex Garland’s screenplay takes generous liberties with the source material. The movie sheds several interesting ideas in the book while adding one or two of its own, but neither the book nor the movie is particularly fresh. This is a story that’s been told before, pickpocketing plot points handed down through generations of sci-fi storytelling. A mysterious force strikes the coastal U.S. As a result, there’s something mysterious going on — something that causes people to kill themselves or kill others, if they’re not done in by other wild creatures. They call it the “shimmer,” a sort of barrier that’s crossed when entering into the territory surrounding a lighthouse at the center of the occurrence. Within this threshold — which is gradually and consistently taking over more and more territory — nature has run amuck. Biology and botany — fauna and flora — merge together, creating strange new strains of creatures. Okay. Some of that’s cool. There are moments of creepiness that evoke the original Alien, but those moments are too few and far between. There’s the classic argument that a person will like either a book more or a movie more all depending on which version they encounter first. Of course, every argument has its exceptions. It’d be hard to find anybody who found Winston Groom’s original novel Forrest Gump anywhere near as endearing as Robert Zemeckis’ movie (the differences in the second half are exceptionally wild). Similarly, most people would deride David Lynch’s film version of Dune in favor of Frank Herbert’s novel. And movie history is littered with examples of adaptations which needlessly fiddle with the source material, turning something like The Devil Wears Prada into The Devil Wears J.C. Penney. Here, writer/director Garland, who rode a wave of success with Ex Machina, guts some of the source material’s most intriguing facets. Certainly at least some of those changes were driven by a sense they simply wouldn’t translate into film. For example, in the novel, none of the characters go by their given names. The intention is to strip each person of her personal background and identity as the collection of five female scientists enter the shimmer – only the latest in a series of many expeditions into the treacherous terrain since the originating incident occurred three years prior. But there’s also an interesting thread involving journals kept by each shimmer explorer that is not even mentioned in the movie. It’s a thread that leads to some sinister revelations and thoughts. As it stands, Garland’s screenplay places a larger emphasis on the relationship between Lena (Natalie Portman, Black Swan) and her husband, Kane (Oscar Isaac, Sucker Punch). In the book, they’re civilian scientists. In the movie, they’re both in the military. And here is also where Garland makes one particularly meaningful change to the events. A betrayal within the couple leads to disastrous consequences for their union, all surrounding the occurrence of the shimmer. That’s a slick adjustment. Even so, the end isn’t worth the long trek to get there; it’s an open-ended conclusion, clearly paving the way for bringing the rest of the trilogy to the big screen. Through it all, there’s an odd sense that the movie is trying to be too smart for its own good, even as characters enter this mysterious land without the slightest concern given to personal protection equipment — like gloves for wading hands through contaminated waters. Granted, that’s a conceit also found in VanderMeer’s book. That sense of being “too smart” is also reminiscent of the highly-acclaimed movie Arrival, based on Story of Your Life, by Ted Chiang. It’s interesting to note both literary works were Nebula Award winners and both movies come across as almost antagonistic in essentially expecting a tacit buy-in to high-minded thematic aspirations. Both movies create a sense of being on the outside, looking in, which in turn nurtures an environment ripe with thoughts about how they could’ve been more rewarding journeys if only there were better opportunities to become immersed in the stories with a more willing suspension of disbelief.